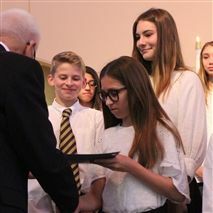 On Thursday, January 31 All Saints’ Episcopal Day School held an Induction Chapel for the 32 newest members of the National Junior Honor Society. The All Saints’ Chapter of the National Junior Honor Society recognizes students who excel in scholarship, service, leadership, citizenship, and character. Congratulations to this year’s inductees. You can see more pictures from the ceremony HERE.